Geoff the Gardener usually watered and picked flowers but today he decided to dig. 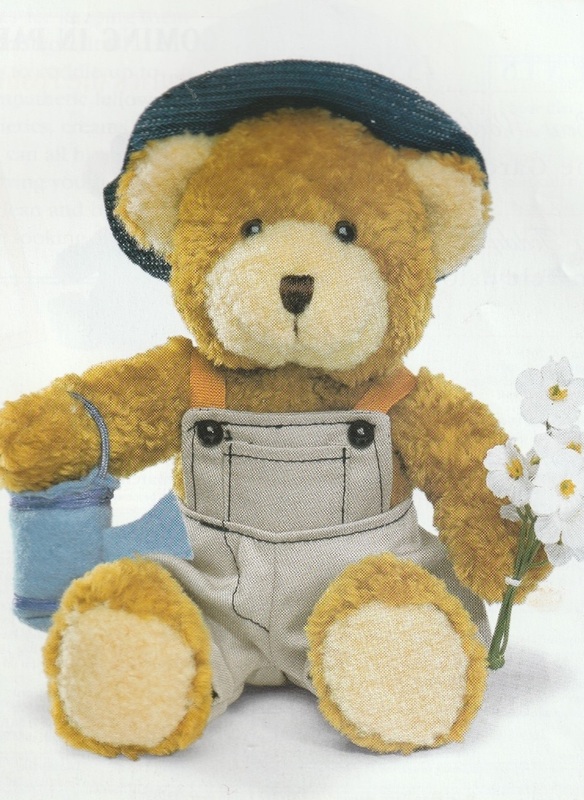 The borrowed spade was very hard for the small bear to use but he stuck in down and stood on the edge. 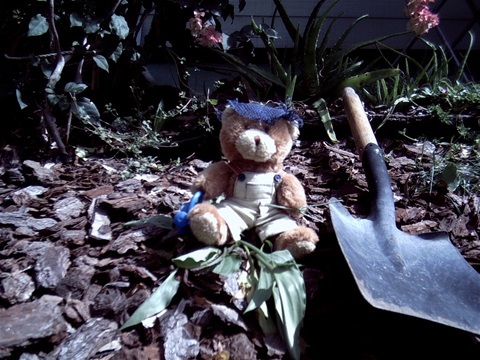 Geoff the gardening bear was very busy one hot sunny day. He was digging in the flower garden. The spade went deeper and deeper into the soil. He struggled with the heavy spade he had borrowed from the wheelbarrow. His hope was to remove all the weeds, water the flowers, and then, return inside. He kept carefully checking to make sure none of the family could see him. He knew it was unwise for any of the special bears to be outside for too long. They would be easily missed if anyone noticed the empty space on the shelf. Before he could remove it and put it on the ground, the huge black and white shape of Missy the border collie dog came up behind him. ‘It’s a bit strange to me.’ Geoff leaned on the large spade for a moment. Then, he smiled up at the anxious-looking dog. The black and white dog barked loudly and bounded in excited circles round and round the yard. It took all of Geoff’s strength to hold onto the spade and maintain his balance as the dog began to lick his little bear-face in her enthusiasm. ‘My pleasure to be of service.’ He bowed formally and seriously. He forgot he was leaning on the spade. He over-balanced and sprawled at the dog’s feet. The dog thought it was funny and began running around the yard barking in excited piercing yelps. Geoff dusted himself down shaking his gray overalls back into place and ramming his blue straw hat firmly back on his head. He stood up. The dog trotted beside the small bear. They laughed companionably together. Henry the Hiker who had just climbed back into the house through the window, nodded in agreement. ‘Oh yes it’s a terrible worry. Special bears like us are such a problem.’ He spoke seriously but suddenly began to laugh. The laughter spread until all the bears were chuckling. Even the ones in the cupboard joined in. Ted thought the sound would carry and the humans would surely hear them. Sophie in her cat-basket snarled a soft meow. In the quiet stillness of the afternoon, no one came to disturb them. Finally, the room was quiet again as they settled back to doze. Only in the distance could Geoff still be heard singing. He continued happily shovelling dirt, for Missy’s special bone place. The spade was heavy so he moved with slow thoroughness.